(NewsUSA) – If you are one of the millions of Americans that have a body mass index (BMI) of 35 to 45, you may have thought about bariatric surgery to lose weight. The problem is that while it works, it’s invasive and there can be significant long-term side effects. So much so that only a fraction of those who are obese consider a surgical option. Now, however, the future of weight loss may just lie in a first-of-its-kind, pacemaker-like device that reduces hunger and leads to prolonged fullness without altering or restricting the anatomy. The way it works is this: the vagus nerve is the communicator between the brain and the stomach. If interrupted, the stomach tells the brain it’s full sooner. Thus, patients eat less and feel full, allowing for safe, sustained weight loss. Approved by the U.S. Food and Drug Administration in January 2015, it was the first weight-loss device to be available to patients in over a decade. “Obesity is a global epidemic with consequences to both public and personal health,” said Sajani Shah, MD, and Bariatric Surgeon, Tufts Medical Center. 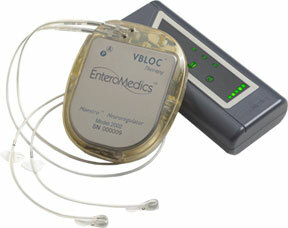 “From diet and exercise to bypass surgery, existing treatment options have failed to stop the advance of this disease.” Created by St. Paul-based EnteroMedics, vBloc Neurometabolic Therapy is implanted in a minimally invasive outpatient procedure and allows patients to eat a normal, healthy diet without food restrictions. “With this new weight-loss option, what’s really important to understand is that it’s less invasive, less complex and there are absolutely no restrictions to what you can eat,” said Shah. “Patients like that it’s reversible, they have more control over their hunger and they have more control over how fast they lose weight. They are able to go back to work within days, and it’s outpatient surgery,” she said. For Erica Roy, who received her vBloc device over 18 months ago, the results speak for themselves. Down 45 pounds, Roy said she couldn’t be happier. “What is amazing to me about this device is that it doesn’t just affect me physically, it works on helping me address my relationship with food,” she said. Roy said the device caters to that group of people who feel gastric surgeries like lap band or bypass are too extreme. For more information, please call 1-800-MyvBloc or visit www.vbloc.com.